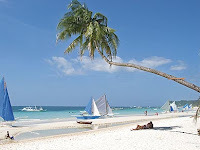 I am actually in Boracay right now while I'm writing this blog. We just had our dinner so we decided to take a few walk outside and look for a bar to hang on. We happened to pass by this internet cafe near our hotel and since I can't help but blog about my vacation here that is why I decided to browse the web for an hour and to check mails as well. It's my first time to be here and I have to admit that Boracay, really is a beautiful place. I really enjoyed the island, the white sand, the bars, night parties and all. I so love life here because every night becomes a party night. I get to spend quality time with my friends, too. We came here yesterday via Philippine Airlines. Then a one-hour trip via van from Aklan airport followed by a 15-minute boat ride to Boracay's white sand beach. The trip was fascinating because we experienced all modes of transportation from Manila to Boracay: by land, air and water. The first day was a whole lot of fun because as soon as we arrived, we had a quick lunch then we quickly toured around the four kilometer-wide white sand beach of Boracay. Then during the night we met some other friends and hopped on a nearby bar and enjoyed the spirits of liquors. We also bought raw food at the famous "D*Talipapa" market and we've had the food cooked right then and there. Sea food is just perfect! I have always been a fan of sea foods that is why I always go crazy every meal time. Lol. Oysters and lobsters are everywhere!